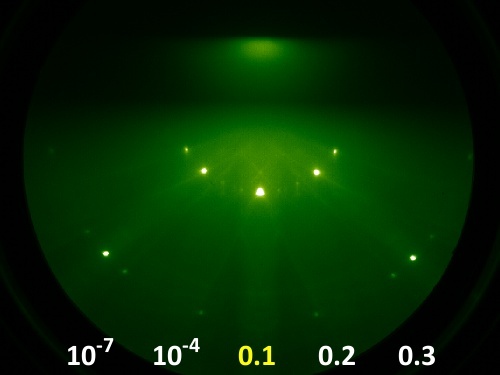 RHEED (reflective high energy electron diffraction) is a powerful tool to monitor the deposition of thin films. An electron beam hits the substrate/film at a very small angle to the surface, so the electrons don't penetrate deep into the material. Diffraction takes place in the top few atomic layers of the sample, so the resulting diffraction pattern contains information about the film surface. 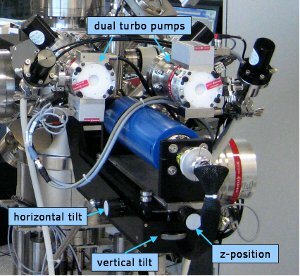 RHEED works well in UHV processes like MBE (molecular beam epitaxy), where the chamber/process gas pressure is very low – typically below 10−6 Torr. The pressure range can be extended somewhat by pumping the RHEED gun (electron source) differentially to prevent cathode filament degradation. 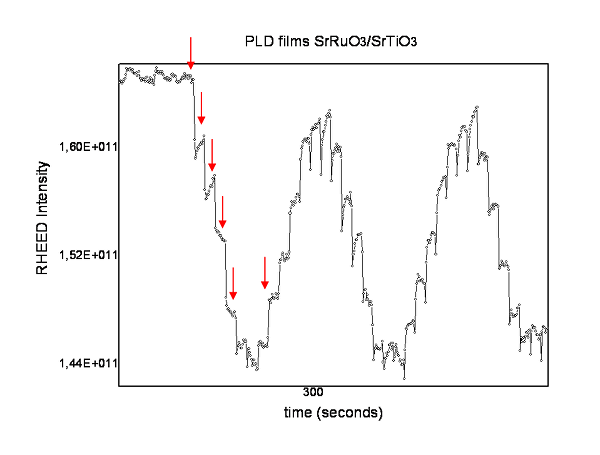 But at the process pressures present in a PLD/Laser MBE system (normally up to 1 Torr), the mean free path length of the electrons is reduced (at 10−6 Torr: ≈100 m, at 1 Torr: ≈100 μm). The additional scattering will blur the RHEED pattern and render it unusuable, as electron gun and RHEED screen are typically mounted 30…40 cm away from the substrate. SURFACE offers a solution for this problem: The SURFACE HP-RHEED system. 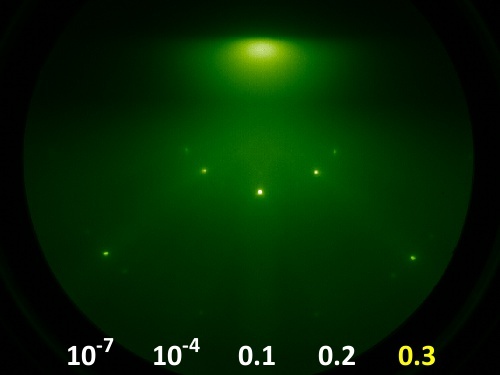 Here the electron beam is enclosed on 90% of its way in a differentially pumped tube. 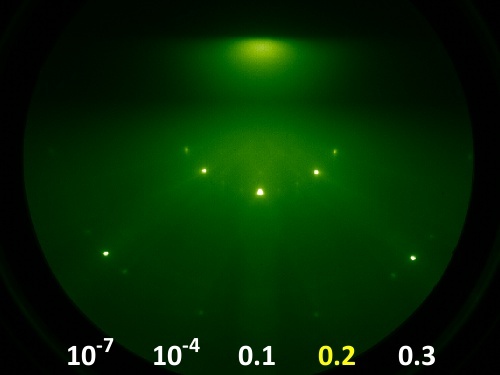 The electron beam is exposed to the deposition chamber pressure only very close to the substrate, so a small spot size and uniform electron energy are maintained at the substrate surface. 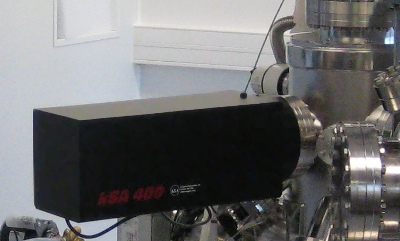 On the electron gun side of the system, a standard RHEED electron gun is mounted on a special manipulator. Two differential pump stages reduce the pressure from 300 mTorr down to the 10−6 Torr range. A guiding tube encloses the electron beam up to a point near the substrate, where the beam leaves the tube through a small orifice. 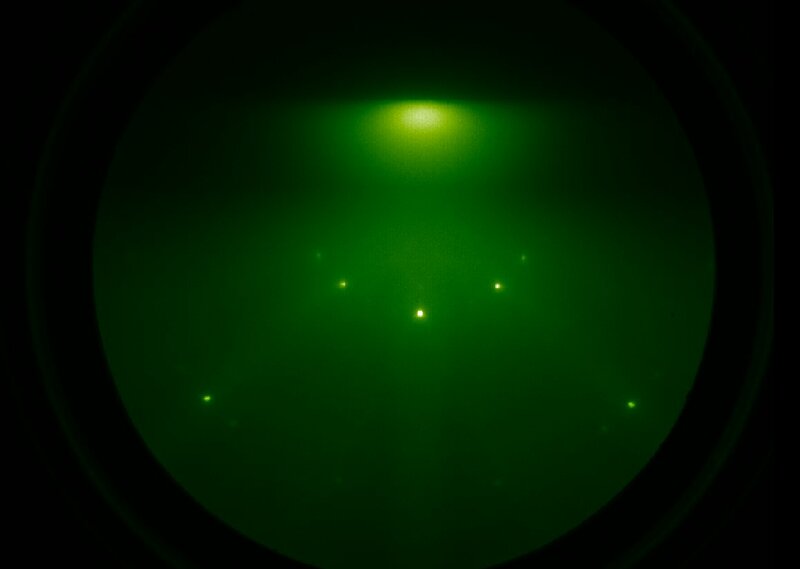 Because the electron beam now has to be aimed through the two orifices needed for the dual differential pumping, beam adjustment solely by the magnetic lenses of the electron gun is no longer sufficient. 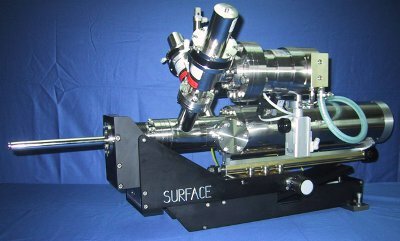 To compensate for this, the SURFACE electron gun manipulator provides z-motion (1" backwards retraction from the substrate) and ±3° tilt in two axes. A specially designed support frame holds the gun assembly, so that these adjustments can be done easily and with high precision. 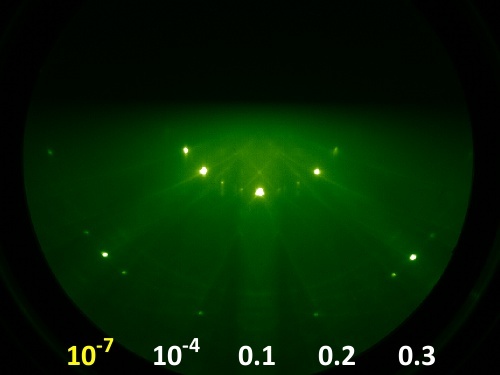 Together with the rotation and tilt features of the SURFACE substrate manipulators or laser heaters, this allows perfect alignment of the diffraction image. A small automatic gate valve built into the manipulator protects the RHEED gun filament from excessive pressure. On the screen side, a standard RHEED screen can be used. Part of the SURFACE HP-RHEED system is the leading edge analytic hard- and software from k-Space. This makes the RHEED system the perfect tool to monitor growth rate, lattice spacing/strain, surface coherence, and surface structure/reconstruction. Optionally, the RHEED electron gun can also be controlled via a k-Space software plugin. The standard RHEED gun for the SURFACE HP RHEED is the R-DEC RDA-003G together with the RDA-004P power supply. This combination offers up to 30 keV electron energy, a maximum beam current of 160 μA, and a beam diameter of max. 90 μm. Supply and controls for the magnetic focus and deflection lenses are built in. RHEED oscillations during layer-by-layer growth. 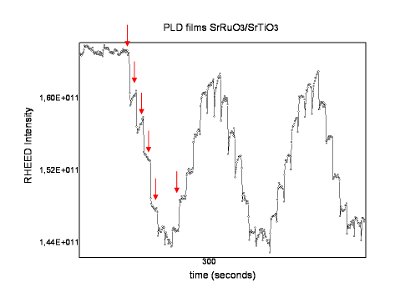 Each oscillation corresponds to one monolayer of film deposition, and each laser pulse is visible (red arrows).